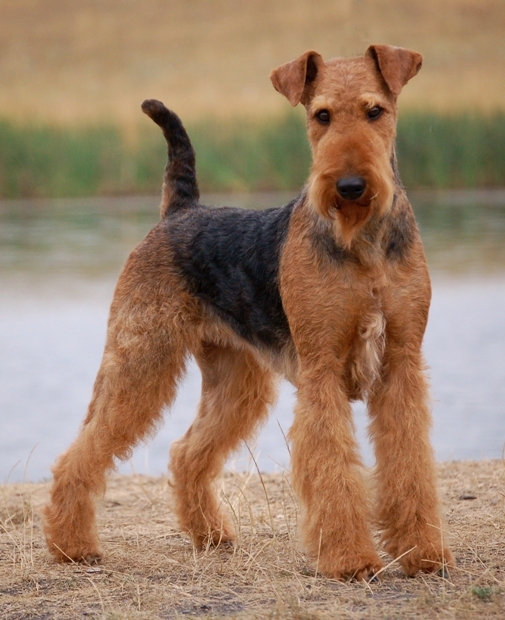 Of all the terriers, there may be none that so embody what we imagine this type of dog to be than the Airedale Terrier. An authentic English terrier finds its home in a specific place – Airedale, of all places – but is just as happy to make its home with and your family. Like many terriers, you will find that this dog is capable of a lot of love, a lot of companionship, and can even make an excellent playmate. Its overall attractive coat is hard to resist for the younger members of your family and you’ll find there’s nothing quite like petting a terrier. There’s a reason, after all, they call Airedale Terriers the so-called king of terriers. 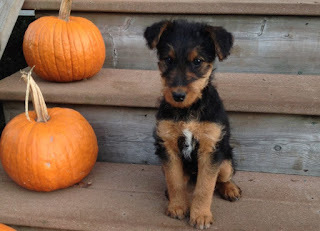 But is the Airedale Terrier for you? Depending on the type of “dog person” you are, your answer will vary. Each dog breed has its own strengths and weaknesses, and these strengths and weaknesses mean specific breeds can be more suitable to certain types of dog owners. 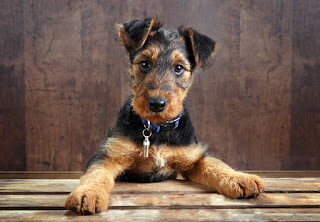 As we learn about the Airedale Terrier, we’ll also learn about the terrier group as a whole and hopefully you’ll just find a little something out about the types of dogs you’d prefer to bring home. 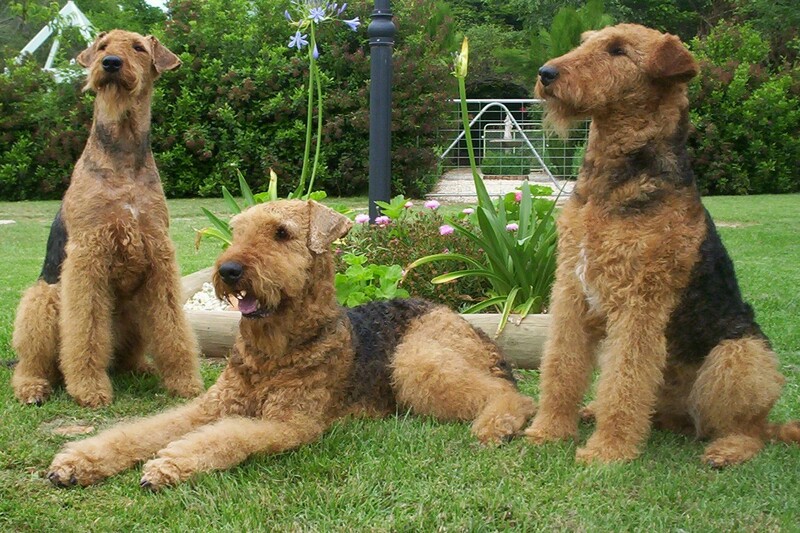 Let’s find out more about the Airedale Terrier. 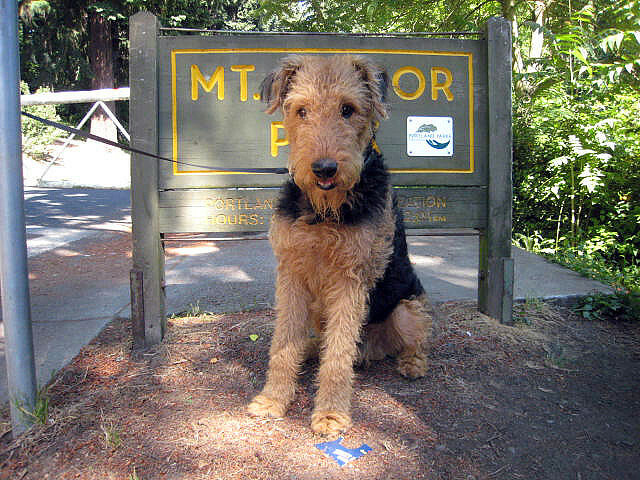 Like all Terriers, Airedales have a natural inclination for digging , chasing small animals, and barking. 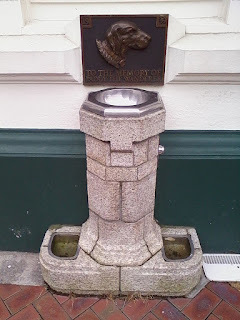 The Airedale Terrier is an active collector of human memorabilia. He will pick up just about anything to add to his stash of treasures. The Airedale has a long, flat skull, V-shaped ears that fold over, small dark eyes full of terrier keenness and intelligence, a black nose, and a muscular, squarish body. The tail is carried up but not over the back. The Airedale’s coat is hard, dense and wiry, with a softer undercoat, and comes in both tan and black and tan and grizzle. 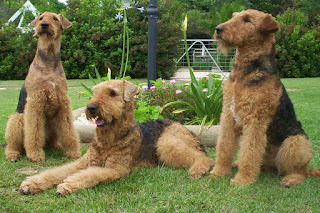 Airedale Terriers are a relatively young breed, created in the 19th century by the working class rather than by aristocrats in the industrial Aire River Valley region of northern England. Their exact origin is not well-documented, but the Otterhound , the Irish and Bull Terriers and the now-extinct Old English Rough Coated Black-and-Tan or Rat-Catcher Terrier are considered to be prominent in their development. Other contributors include assorted setters and retrievers, sheepdogs such as the Yorkshire Collie, and Bedlington Terriers. 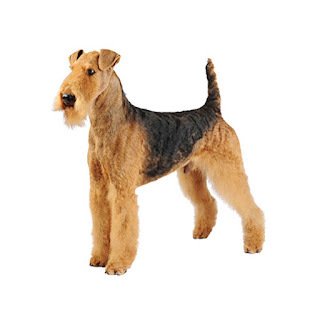 What we know today as the Airedale Terrier first emerged around 1840 and was bred to hunt otter, duck, weasel, badger, fox, water rat and other small game. The breed’s intelligence, agility and strength, combined with almost boundless energy, made them equally valued as guard dogs and personal companions. These unique terriers have been used as rat-killers, duck-catchers, deer-trackers, working dogs, war dogs, hunting dogs, guard and police dogs, gun dogs, army-messenger dogs and all-around sporting dogs. They were used in both World Wars to locate the wounded and to carry messages and medical supplies. They have also been used to hunt large game. 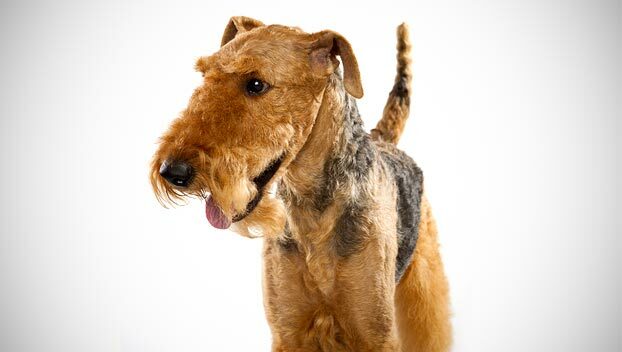 The Airedale Terrier, which has an average lifespan of 10 to 13 years, sometimes suffers from colonic disease. Other serious health issues this breed is prone to include canine hip dysplasia (CHD), gastric torsion, and hypothyroidism. To identify some of these issues, a veterinarian may run thyroid and hip exams on the dog. Training and socialization are essential for the Airedale, beginning with puppy classes. Incorporate socialization with training by taking your Airedale with you to many different places — the pet supply store, outdoor events, long walks in busy parks. Anywhere there are a lot of people to meet and sights to see is a good place to take an Airedale. The Airedale is a thinking breed – in addition to keeping his physical activity high, he will require mental stimulation as well. Basic obedience should be conducted with confidence and positive reinforcement. This breed likes to be the Alpha Dog, so it is important to establish who is in charge from an early age, and always be consistent, because Airedales will take a mile if given an inch. They excel in advanced obedience, tricks and agility training, thanks to their high intelligence. Training should be conducted with treats, and a drill-style of repeat tasks works best to keep an Airedale Terrier's attention. Regular walking and play is recommended – and, in fact, regular discipline with exercise should be considered mandatory for dogs of this size. They can handle a lot and love getting outside and exploring their agility and instincts. Airedale Terriers are a high-energy, thinking breed. They need as much mental activity as they need physical activity, and apartments are not the right living situation for them. Families with large, fenced yards are ideal, as the Airedale needs plenty of room to run during the day. 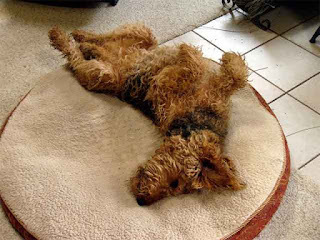 They enjoy chasing and hunting, so fetching and hide-and-seek games are among an Airedale's favorite activities. Airedales need a weekly brushing and professional grooming every two months or so to look their best. That is all they need – unless you’re planning to show your dog, in which case you’ll need to be doing a great deal more laborious work on that wiry coat. 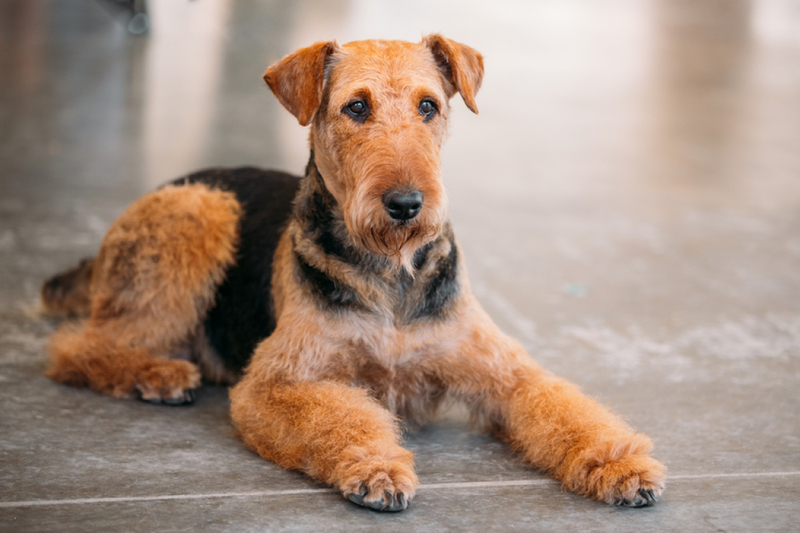 The family Airedale doesn’t have to be trimmed, but many owners do have him groomed by a professional groomer three to four times a year to give him a neat appearance . The coat is either trimmed with clippers or by stripping, a process by which coat is thinned and shortened with a stripping knife, a sharp, comb-like tool, or a combination of both. The Airedale Terrier is not known for extreme shedding, but he does shed certain times of the year. Regular brushing with a slicker brush once or twice a week keeps the coat in good condition. Bathe the Airedale only when he’s dirty. Bathing him too often softens the coarse terrier coat. The rest is basic care. Trim the nails as needed, usually every few weeks. Keep the ears clean and dry to prevent infections. Check them weekly for redness or a bad odor that might indicate infection. If the ears look dirty, wipe them out with a cotton ball moistened with a mild pH-balanced cleanser recommended by your veterinarian. Brush the teeth frequently for good overall health and fresh breath. It is important to begin grooming the Airedale when he is very young. An early introduction teaches the independent Airedale that grooming is a normal part of his life, and teaches him to patiently accept the handling and fuss of the grooming process. The Airedale is the largest of the terrier breeds and was one of the first breeds trained for police work in Germany and Great Britain. In World War I, he worked as a guard and messenger dog. Is the Airedale Terrier the Right Breed for you? Moderately Easy Training: The Airedale Terrier is average when it comes to training. Results will come gradually. 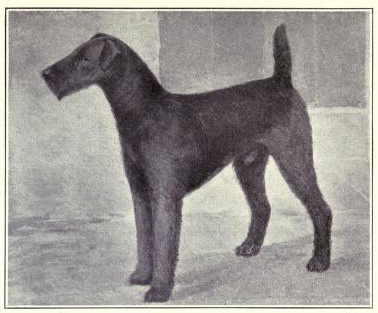 Laddie Boy- (July 26, 1920 – January 23, 1929) was an Airedale Terrier owned by US President Warren G. Harding. He was born in Toledo, Ohio. His father was Champion Tintern Tip Top. He was presented to US President Warren G. Harding by Charles Quetschke of Caswell Kennels and became a celebrity during the Harding administration. Paddy the Wanderer- was an Airedale Terrier who roamed the streets of Wellington, New Zealand, during the Great Depression. He was a friend of cabbies, workers, and seamen alike, who took turns at paying his dog licence every year.Paddy was known for greeting sailors in the Wellington Harbour and accompanying them, as a stowaway,on their coastal steamers.